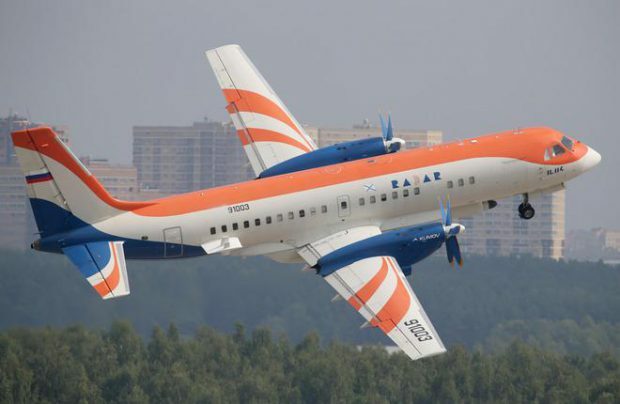 The final assembly line for the revived Ilyushin Il-114 regional turboprop will be arranged at Sokol plant (part of the RSK MiG) in Nizhny Novgorod (Russia), announced the United Aircraft Corporation’s president Yuriy Slyusar, confirming earlier rumors. The final decision to re-launch production of the Il-114 twin-engine regional turboprop was made in May 2016 following a presentation of similar programs – Ukrainian Antonov An-140, Chinese Xian Aircraft MA700 and local Tupolev Tu-324 to the Russian President Vladimir Putin. According to Slyusar, about 40% of Il-114’s production may be located at sites in several regions along the Volga river. Plans call for production of twelve Il-114s per year. The program cost is estimated at 55 billion rubles ($845 million). According to Vice-minister for industry and trade Andrey Boginskiy, 2.6 billion rubles will be allocated in 2016 for research and development, including engine development, and modernization of Sokol’s facilities and equipment, as well as organization of after-sales support. Several OEMs, including RSK MiG, Ilyushin, Aviastar-SP, Polyot and others, will be engaged in production of the aircraft. To speed up the launch, the kits produced by Tashkent Aircraft Production Organization (TAPO) may be used. Located in Tashkent, the capital of Uzbekistan, the company (now Tashkent Mechanical Plant) was the Il-114 airframe producer until it curtailed production in 2012. The Il-114s assembled in Russia will be powered by upgraded Klimov TV7-117SM engines. Production of the poweerplant kits has recently been launched at Chernyshov enterprise in Moscow. Il-114 is capable of carrying up to 64 passengers as far as 1,500 km. Designed by Ilyushin Design Bureau in Soviet times — in mid eighties, Il-114 first flew in 1990. Some twenty Il-114s have been built.